Rough Edge:	The name of the band, John. Is it true that it was the name of a Smith's B-Side? John Nolan: That's actually not true, no. I think Ed (Reyes, guitarist), and Adam, (Lazzara, vocalist), said it a few times in previous interviews because it sounded cool. It's amazing, The Smith's have helped us out ... (laughs) but people are a little upset when they hear it's not true because it does sound cool. It does not seem to have deterred their fan base too much. Although TBS currently play small venues they always pack them out and are become renown for their frenzied and intense performances. So intense that Adam recently ended up in hospital and is still hobbling around on crutches. So what happened? John Nolan: It was terrible actually. He was onstage during Midtown's set (who they were on tour with) recently and he was dancing on stage. He fell off the front. It was scary because he was bleeding all over the place. We first feared for his life because he had this bad head wound. Then the ambulance got there and so ... it was really just scary because we had no idea what was going on. They were still not quite sure how his dislocation really happened; (he also dislocated his hip). It was just weird. Rough Edge: So he wasn't even on stage playing in TBS? He was just dancing with Midtown? John Nolan: He (Adam) is going back on the road earlier than expected, yes. We did the last three shows of the Midtown tour, which were back in our home area, and then we're going back on tour in a week. We did those last three shows as an acoustic set sitting down because we wanted to do it and, as I said, they were all close to home. Rough Edge: We heard that Ed and Floyd (fellow band members) stayed out on the road. Do you think it was hard for those guys to be at the shows and not play? John Nolan: Yeah. At first we thought we would be back on the tour in two weeks. We didn't know the extent of what happens if you have your hip dislocated. We figured a couple of weeks and you're as good as new, which obviously was not the case. Then as time was going on, we realized it just wasn't going to happen. It wasn't feasible. They (Ed and Floyd) stayed on and kept selling the merchandise. I think it was hard, for those guys, just in general, to be out on the road just two people. It's hard enough when you have a group of guys, then when you put just two of them together for that length of time, I am not sure I could handle it. Rough Edge: I was reading online that some of your fans seemed angry you canceled some of the shows because of the injury although some rightly sympathized ... what do you think about those two contrasting opinions? John Nolan: I was a little shocked. I just saw it on the message board and I know Adam was on the message board and so he saw it too. It just shows how insensitive and kind of stupid some people are. We're a band who's done nothing but tour for the past six months and done nothing but given people every opportunity to come see us wherever they live and get everywhere we can. Then something like this happens and people just turn on you so quickly. It's mind boggling to me especially considering the extent of the injury! Maybe some people just don't realize what happens when you dislocate your hip - how bad of an injury that is and if Adam doesn't heal properly form this, for the rest of his life he'll have a problem. It's not something we had control over. Rough Edge: So I see you're playing a few dates with Box Car Racer? How excited are you? You should get a lot of welcome exposure. The big difference between the bigger bands and these guys all on the cusp waiting for their breakthrough? The mutual respect and admiration they seem to have for each other. We put that to John. Rough Edge: When you're on tour with somebody, say on the Deconstruction tour, you have bands wearing each other's t-shirts, helping each other set up, is that kind of unity rare when you tour with somebody? How hard is it getting to know somebody you're on tour with? John Nolan: Well ... I can only speak from our experience and I think we've been really lucky in touring with bands that we have clicked with and just hit it off. Just about every tour we've been on we've made pretty close friends with most of the people in the bands. In some ways, you almost can't help it because you're surrounded with these people every day for a month and a half or whatever it is. For our band we've known we are gonna get along just fine within a matter of the first week or two, it's like you just click and you feel like you're close with them even though you've only just met them. We've been very lucky that way. We've also gotten to go on tour with a lot of bands we're already friends to begin with. That helps a lot. Like Midtown of course. Seemingly almost constant touring partners but also strict vegetarians and all pro-animal rights, does any of that rub off when you are in such close proximity to these people day after day? John Nolan: No, not really. We've played with them before and they're not like that at all - they don't preach to any of the other bands. So for the most part, everyone is very cool about everything and they keep it to themselves. Rough Edge: Do you have any vegetarians in the band or any animal rights activists? Where do you guys stand on these issues? John Nolan: I'm personally indifferent. I stand behind anyone who would decide to take a stand on that and I wouldn't feel opposed to it all but to me it doesn't seem like a pressing issue in my life. Adam, our singer, was a vegetarian for a while. But after a while, he ended up soft. He went back to eating chicken, just not all the way back to hamburger and steak. Rough Edge: I know you guys are big Smiths fans, although we dispelled the myth of the band name, so was that the Smith's period in your lives? John Nolan: It totally was. I loved the whole Smiths scene - it was totally an oasis because I'm a confused Smith's fan. Morrissey, I think, is absolutely unbelievable. Rough Edge: So let's go back in history a little, back to the heady 80's days when the lads of TBS were still worrying about acne and how they could get enough money together to buy a copy of "Meat Is Murder." Please tell us how you all came together. John Nolan: No one was really in any kind of band that went anywhere. All of us basically did the same stupid high school bands, you know, play with your friends and different shows locally, but never really made it anywhere. We all have that going on; I've had bands since I was 14 years old. Some of us did well from Long Island, but it never went anywhere for anyone else and Adam was in North Carolina doing the same thing as the rest of us. It was just amazing that we all came together when we did. We're all friends of friends; we were all looking for something and it ended up happening very coincidentally and very amazingly. Rough Edge: Cool. Strange how people are thrown together sometimes. John Nolan: Right. Especially Adam coming from North Carolina. We played there and he came to one of our shows and kind of suggested he move to NY to play bass with us and he actually ended up doing it. Everything came together so coincidentally. It does seem like there was some kind of plan or purpose involved. It's too perfect. From there it was onwards and upwards for these upstarts whose sound seems to cross all genres but whose angst and youthful frustration always shines through. Like so many other bands of the same age and with anything like a unique sound - the awful term "emo" gets thrown around as it seems to fit easily for a lazy media who want nothing more than for every band to be pigeon-holed. John Nolan: I've said it many times before and Adam's said it too, I think it's a ridiculous term and it's basically a meaningless thing. It's like something that you've said guiltily and kind of made fun of one of your friends with. You know, like, oh-you're so emo, you're so wet. It was just a fun thing to say. No one ever took it seriously, you know, especially the bands that were being called that a couple of years ago and now it's stuck and it's become this thing where like - you know, "We're emo" bands are proud to say it. Like it's an actual term to use; you read it in magazines all the time. But to me it's meaningless. Rough Edge: Everybody gets labeled with something though, don't they? John Nolan: That's the thing - it's unavoidable. You can't get too upset about it. It's just silly more than anything. I would like to not be labeled emo, but you know I can't stop it from happening. Rough Edge: TBS pull from so many diverse influences, which becomes apparent on listening to the debut album. However, is there anybody they idolize? Who do such a unique band with such drive and intensity look up to for inspiration? John Nolan: I would say Radiohead. There is a band that I just looked up at from the very beginning and they've just grown and grown in every way. As far as their songwriting and as a band, it's gotten better and better. It breaks musical ground. I would love to be able to do that as a band-to be able to grow and not only get better as a songwriter and a musician, but also start to have some innovation. Not only that but they continue to be successful at it. I look at their band and I'm amazed. I can't believe what they've done as a band and especially Tom Yorke as a musician. 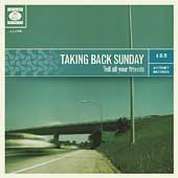 Rough Edge: So in closing, if there are readers who have yet to hear about Taking Back Sunday, what would you want to say to them? John Nolan: I would say ... I would say base your opinions of us solely on what you actually think and feel about our music and don't base it on what anybody tells you is good or bad about our band. Pick up the album, listen to it yourself, and decide what you think about it yourself. Try not to be too influenced by anybody - friend or press. That's really what it comes down to. Copyright � 2002 by R. Scott Bolton. All rights reserved. Revised: 23 Aug 2016 22:57:11 -0400.